Each and everyone one of us can remember using a microscope back in the days during the science classes. The frustration and effort of adjusting the focus knob got the better of us. However, it finally opened a new world for viewing which was fascinating. Children are curious by nature. Herein, it would be great to get them a microscope at a young age. This will assist to satisfy their scientific curiosities in a more educational way. 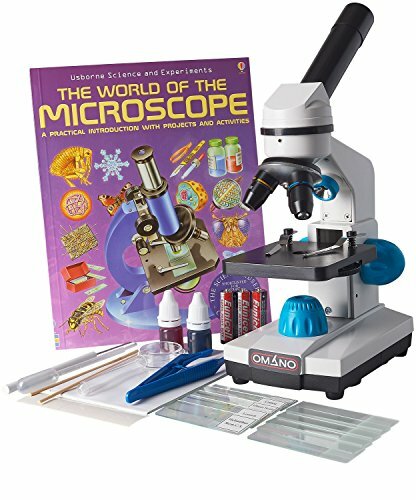 In this article, we shall have a review of the ten best microscopes for kids and students as well as what to consider when purchasing before you buy one. 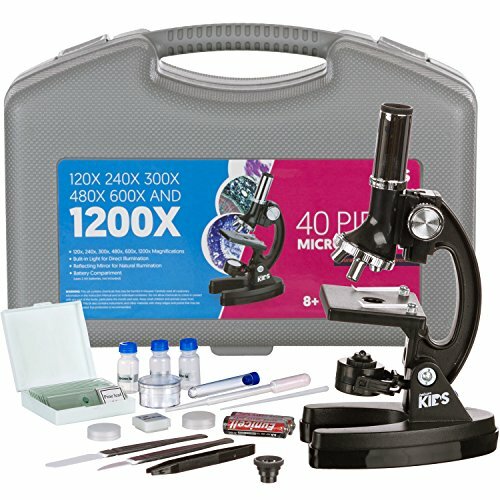 We will also get to answer some of the frequently asked questions so you can have a better understanding of the best kids’ microscope kit in the market. There are several reasons why you need to get your child a microscope at a young age. It may be for educational gains or at times curiosity and leisure satisfaction. A microscope helps children interested in science and the environment they live in by showing aspects of the world that they may not see with their naked eyes. It stimulates your child’s brain and interests. Every child deserves to foster their education in sciences in the best way possible. A microscope is one of the ways. We are also aware that children respond better to learning when they actually do it by themselves and in a way that they enjoy. Although professional microscopes are much better, they are also quite complicated. 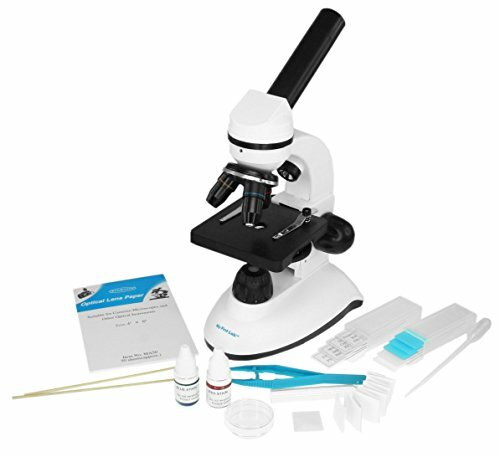 However, as your child learns with the kid's microscope, he/she can then easily use the professional one in the future with no difficulties. While a professional microscope may be very costly, you may feel the pinch spending on it and end up broken after a few days. Kids are never always careful. Get the kids microscopes as they are fairly cheap and quite durable. Importantly, get those with cheap and easy to fix accessories to avoid the extra cost of hiring a professional to do the job. There have been developments that have made the instrument more durable and easier to use for children at a younger age. It is therefore good for a child to have a microscope to explore the scientific world and learn in an exciting way on the environment. They also acquire skills and practice that in turn can be enhanced at an advanced stage in school easily. 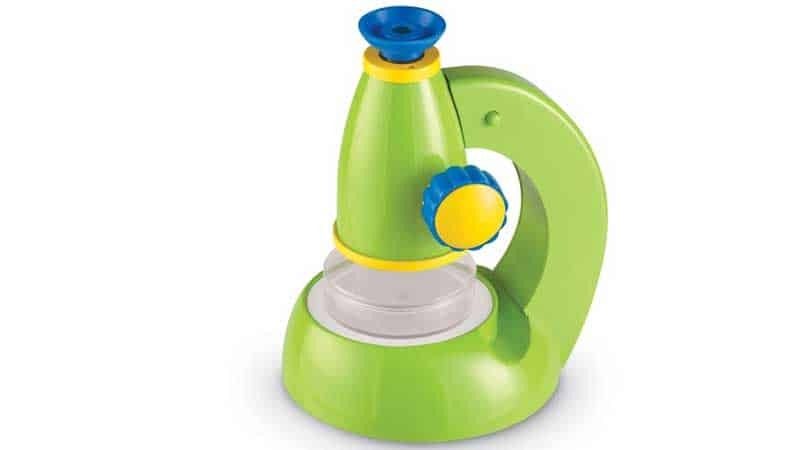 Below are some of the 10 best microscopes for kids the market. We have also noted the pros and cons of each to help you make a better choice as per your needs and taste for your child. Learning is a continuous process that requires step by step processes. Kids require such kind of knowledge transfer. Having a microscope for them that offers a sequential kind of learning is very important. The AmScope Kids Beginner Microscope is such a device. With this, your child is guaranteed a perfect foundation on the use of microscopes. It is a nice set especially for those who prefer starting with the basics and slowly escalate through to higher stages. Kids are able to view and observe the specimen via the monocular head. The magnification is wide and the options run from 120X all the way to 1200X. This is a very good range for a beginner scope. The device is a great deal if one wants kids to learn and have their skills improve with the continued use of the set. It comes with a coaxial course focus and an accessory kit which contains over 50 accessories. This is an awesome gadget for kids who are especially interested more in the field of biology. Universally standard products have become very rare and difficult to find. Such shortcomings are attributed to the fact that there are a lot of counterfeits products in the market. It is important to buy from a recognized dealer to avoid such issues. Herein, the Lab duo Microscope for instance, if bought from a correct dealer, is such an example of a globally standard product. This is one among the few microscopes that have won an award. It comes with a full accessory kit. The microscope is portable hence can be used as you move from place to place. One fascinating feature is the ability to view flat objects as well as those that require three dimensional. The scope is both stereo and compound. This means your kids will learn in an easy way on how these two kinds of microscopes operate. Interestingly, the scope is dual and equipped with optic glass that is real. This means that each glass 10X and also 4X, 10X, 40X on the eyepiece and glass objective respectively, while the objective lens is 40X, 100X, and 400X in magnifying power. It also has a manual and a warranty of up to one year from the manufacturer with a money back guarantee. It is recommended for ages 9 and above and lightweight hence perfect for both indoor and outdoor activities. Sometimes, we all want a purchase that saves money and guarantees your durability. Kids at times may be careless hence you need to get them something that you are sure will last. The Omano lab microscope is such an item. It is a mixture of quality at affordability. This is a metal microscope that allows viewing with a magnification power up to 400X. It cannot be termed as a toy since it has some useful and advanced features that can be used by older kids. This microscope indeed has professional capabilities. The objective lens and magnification power are as high as 400X. Due to the high magnification power, the scope is suitable for college students. However, it has an easy viewing system, and children under the guidance of a grown-up can enjoy using this set. The microscope is good for Students who enjoy viewing very small details of specimens from a tender age. If your child shows signs of being too smart, then this is a great choice to go for. It is a great scope and worth every penny as it lasts for a long while. The contemporary world is often associated with lots of digital advancement. Again, kids tend to embrace technology more than anything else. Imagine how great it is getting a microscope that is technologically enabled and efficient. This is what the pluggable USB digital microscope offers. It comes with its own stand with a flexible neck to move the scope at will. It operates on computers that operate on Windows and OS X which can be a disadvantage when it comes to someone whose gadgets are not run by these two. Nevertheless, this is a small con considering the function the scope performs and its modern style.It has LED lighting system and adjustable brightness together with a 2 megapixel and a 250X magnification power capability.Therefore, images always appear clear and crisp.This gadget, however, is good for viewing bigger items. The images can also be displayed on a computer’s monitor to view the specimen at an even larger point. 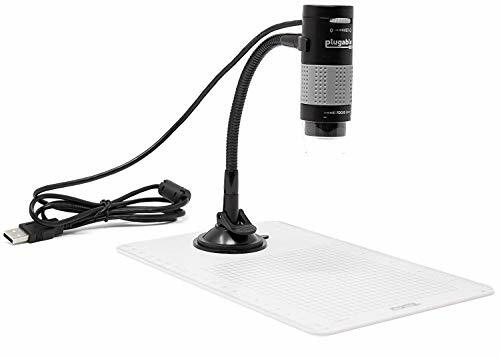 The microscope is compact and comes with a simplified stand. This, in turn, allows it to be easy to move or transport. The microscope manufacturers have put technology into consideration as far as the design is concerned hence a perfect consideration for teenagers. Its neck may be bendy but it does not do so to some extent that one may have liked.It may even have the object to be viewed at a closer point. Therefore, you may find yourself taking it out of the stand so as to hold it for better viewing. Stylish products are often associated with poor performance. However, with the Nancy B’s microscope, you do not have to worry about such issues. It guarantees you perfect work and importantly, stands out. The product is among one of the best currently in the market. 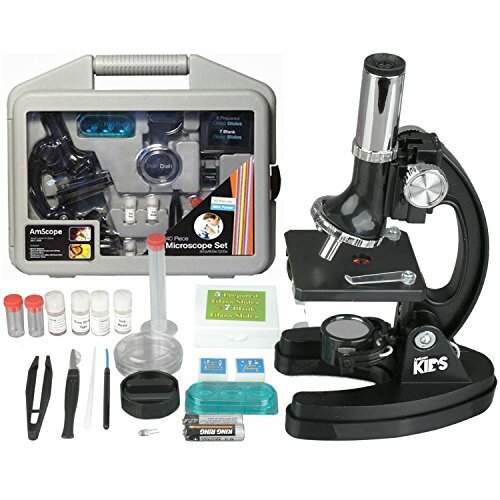 This is a gadget so amazing to play with as it comes with a comprehensive activity journal accompanying the microscope. Interestingly, it is styled in a combination of interesting color. It has a magnification power of 400X. This shows that despite the good looks, it is also awesome in terms of quality. The device also has a tool set with 26 pieces. Again, it works both as a light microscope and dissecting ones. You do not have to worry about the weight of the microscope. It is very portable since it weighs only one pound, hence can be carried to any place by your children. 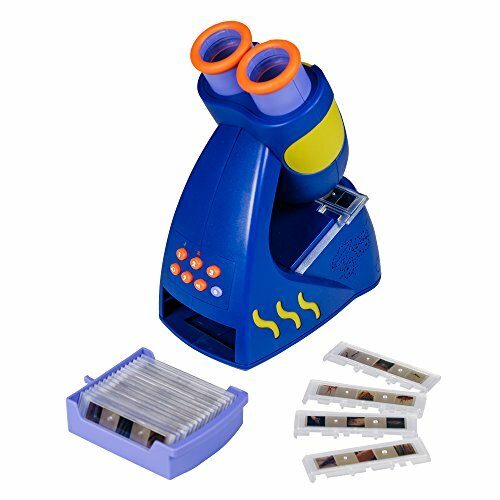 Older children get to enjoy using this microscope better as they discover the world’sdetails with it. Lastly, it is suitable for both boys and girls from the age of 8 years and above. Technology is one of the most evolving fields. Science and research have in fact been made so easy by the advancements in this field. Children are always up to date with the latest technology. The Celestron 5MP digital microscope manufacturers have ensured that tech is key in their device. In fact, you will be stunned by how amazing this device can get. With this device, one can take photos of up to 5MP as well as videos and has a magnification power of up to 200X. Moreover, larger specimens can be viewed using the lower magnification power. It has a digital scope with a stand to enable one to use it in a traditional way or by holding it yourself. It comes with a USB cable that is long enough for use with a device that is far from the scope.The microscopeworks on a gadget run by Windows and OS X and has special software used to perform tasks such as saving and editing. It may be hectic for a young child to get his/her way around it.This is due tothe very advanced technologies making it a great option for older kids. The screws used for adjustments are somehow difficult to adjust as compared to other scopes. This is experience when one wants to change the position of the scope up or down. You cannot get so close to the specimen being viewed since the plastic cap cannot be removed and hinders one from getting closer to the object. We all want a product that comes with enough accessories. You do not need to spend a lot of money on a product, and still further spend on more items that will complement the proper function of the device. With the Thames and Kosmos Biology Tk2 Scope, such issues are taken care of. You will simply get all you need in one package. 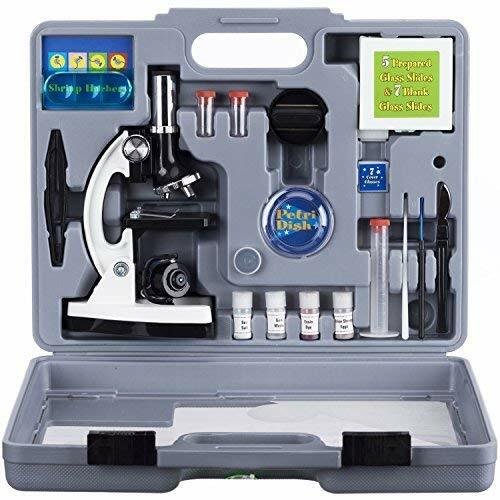 It has an accessory kit which contains 20 tools and is very useful for the aspiring young scientists. This device has a magnification power of up to 400X. Again, it is quite light with weight up to 2.29 pounds, hence may be easy to move around. This makes it better for short term adventures or tasks that do not require a lot of movement.It has interchangeable features. This means you can change the lens from ocular to objective making this a device even more interesting. It uses an LED light which makes it more favorable when viewing even in dark areas. The microscope is so easy to use that a kid as young as 8 years can work with it comfortably. Photos are one of the greatest ways of the modern way of learning. In fact, in recent years, photos have been widely used in the field of science due to the proper image quality. Imagine having a microscope that can take photos as your child takes up the study and gets to review later. This is what the AmScope Compound Microscope offers. It has a 3Mp camera and a USBto take, display, and transfer images. Consequently, it can be used on gadgets powered by Windows. However, you can customize it and users of OS X can also enjoy using it. This scope has a monocular used for viewing and is capable of amazing viewing due to the 45 degree vertical. It can also rotate at an angle of 360 degrees giving one several viewing options. This microscope has a standard magnification power. Since it is cordless, it is easier to charge hence a great instrument to carry if one is traveling. Importantly, it is relatively light with a weight of almost five pounds hence less portable. 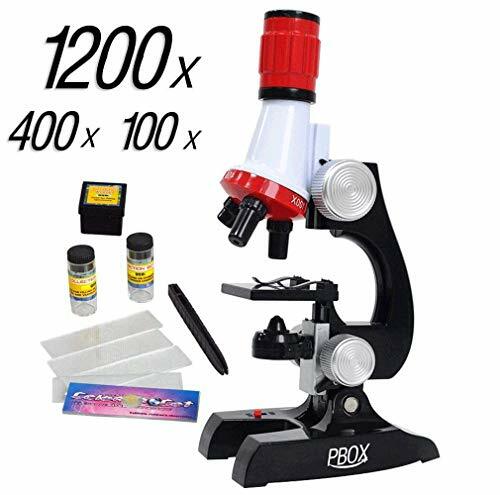 It is great for students who are looking forward to attending college and will need a microscope to use in school. Science is one of the most difficult fields of study. You are then likely to succeed in the field with proper tools and devices. With the invention of three-dimension technology, it is much easier to study diagrams perfectly. My First Microscope is such a device that offers a 3D view. This scope provides a 3D magnification. The perfect high view is attributed by the two-layer powered eyepieces. It has a magnification power of up to 8X as well as focusing knobs hence great for children. It also has LED lighting feature that makes view much easy on dark areas. Compared to other scopes of its size, this microscope is light to move around with and has a nonskid feed. This ensures that it cannot slide and break easily. It has really exciting colors and tools that are easy to adjust. This, in turn, allows it to be less problematic for young children to use and operate. Overall, the microscope makes a great toy for kids’ aged three, both boys and girls. Portability is one of the most key things to consider. Children are often bored staring at one point. You then need to get a microscope that is lightweight for them to move. Importantly, the weight will help in avoiding damage as they move the device. The Carson Microbite Pocket Microscope will offer you this. It is a great scope especially for those children who need to learn and gain more knowledge of the move. Ideally, it is very portable and one can go with it anywhere. It weighs 1.6 ounces which is perfect for kids to move around with ease. This pocket device works with 3 LR-44 batteries and also comes with a warranty from the manufacturer. The price is also not outrageous hence very affordable and a good choice for the kid to start out with. It has a magnification of up to 40X, on the lower side compared to the other microscopes. Its weight is generally what makes it a perfect choice compared to other microscopes of its standard. There are different sets out there and one should choose according to what best fits their needs. The microscope market has grown over the times due to changes in technology. There are varieties to choose from hence one should make a careful choice. Below are some of the considerations one should look into before buying a microscope. This is one of the most important features to look at when buying a microscope. Higher magnification power is not always the best choice since the user may be planning to view larger objects like leaves and rocks. Such objects require a lower magnification option. A lower magnification is better for young users as well as preschoolers. This is because they may not be viewing complex specimen. Also, a lower magnification scope is a good choice for them as it will not distort the focus for the bigger objects. If shopping for an older child, you should get a scope with a magnification power of up to 400X. They are better for advanced observing that requires proper exploration. 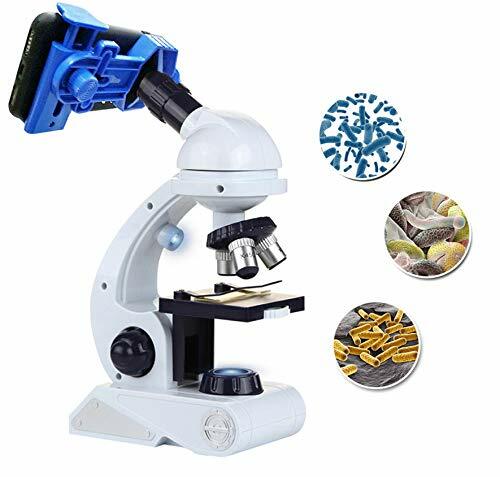 Kids can be rough with their toys hence one has to find a toy microscope that is sturdy and easy to use without breaking. Consequently, it ought to stay for a long period of time and be easy to clean. Having a microscope break after a short period can be frustrating for both the parent and child because you will have to go and buy a new replacement. Cleaning is also an important thing since most of the time, the microscope will be in contact with your child’s sensitive areas like eyes. In addition, a dirty lens makes it hard to see anything under it. One should ensure it is well wiped and clean too for better viewing. How easy it is to move and store the tool is also another important issue to look. You may want your child to be able to carry their microscope around when moving from home to school, to a friend’s house or a vacation. A large and heavy device will be hard to move even on short distances. Kids get bored staying at one point for long. However, a smaller and lighter device is better for learning on the go. This is because your child may want or need to play with their friends or use it to view items outside as they are moving around and playing. However, for the older kids, you can but one that ought to be kept at one point or weight they can handle. When buying a microscope that connects with a computer, always check to ensure that you are getting one that is compatible with your computer. Imagine buying a device that is not compatible with your computer, projector or other digital devices. It can be frustrating and very disappointing to you and your child. Most of these microscopes can either work with devices that are run by Mac or Windows. One should first make sure that the kid’s microscope kit he or she is buying is compatible with the devices at home or the place they are going to use it at. This is an important factor to consider as it is advisable to purchase a lens that is of good quality to avoid breakage. Also, for young kids, you can get them plastic lenses as they are cheaper and the younger ones do not do much while older ones can have real glass lenses. However, plastic lenses are not the best choice if you want your child to have a better view of the object. Alternatively, get a glass lens that is not easily damaged and has a better view when it comes to the observation of objects. Very young kids need to be supervised when using lenses as they can break the glass and hurt themselves. Younger children in preschool and below do not require highly advanced children’s microscope since they basically focus on viewing larger objects. 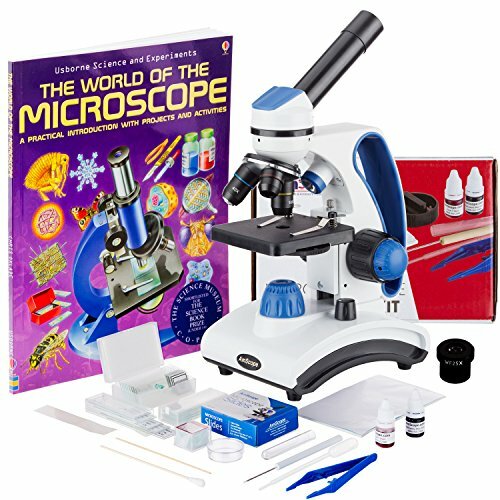 Older children, on the other hand, require a more advanced student microscope as they will be more interested in viewing things like cells and bacteria. Such items require a higher magnification power, hence need of a more advanced microscope. This all depends on the age and size of the child. Smaller and younger children may find it difficult to view on both lenses of a binocular microscope at the same time.Hence, a monocular viewing experience will be more beneficial to them. However, the binocular microscope enables one to use both eyes, therefore, having a better observation. Q: How do you calculate the magnification of a microscope? A: This is done by simply multiplying the magnification of the eyepiece by the magnification of the objective lens. Q: Does the high powered and low powered microscopes differ? A: The definitions put out there are not so clear and therefore it is a bit hard to give a clear answer to this question. This is because there are two types of microscopes, a light microscope, and a compound microscope and both have different high and low powers in terms of the magnification. It then depends on which one is on use. Q: Which model should one use in terms of objectives when teaching? A: It will depend on the observations you want to make. Most basic microscopes have three objective lenses. They commonly have a magnification power of 4X, 10X, and 40X. Microscopes which are more advanced and meant for the teaching purposes have an added fourth objective lens known as the 100x oil immersion objective lens. You will be able to get more magnification if one uses the 100X objective lens. However, it will be difficult to focus on objects as compared to using the scope with only three lenses. Also using this oil immersion method can be so tiresome and quite expensive. Using the three lens scope can help one save a lot. Q: What is a microscope’s field view? A: This is the magnified circle or diameter viewed as one looks on the eyepiece. If the magnification is higher, then the view surface is smaller. One can get the exact measure of view by placing a ruler beneath the objective and counting the millimeter lines that fit inside the illuminated circle. Q: Can I view germs under a microscope? A: No. It is not possible to view germs under a microscope that is not advanced. This is because these microscopes have a very low magnification power. You can be able to view germs with one that has a magnification of 1200X and not forgetting to stain the specimen. In short, you will need a specially prepared specimen and a high magnification powered microscope. However, there are some huge species of bacteria, which can be visible under a small magnification power.Sadly, most of them do not live on the same making them difficult to come across. Q: What is the meaning of a diopter adjustment? A: This allows one to be able to focus on one eyepiece at a time since there is a difference in vision for both eyes.And, the diopter simply compensates for this. The diopter needs to be adjusted well so that both eyes can view comfortably and make good observations. From the above review, you are now ready to go to the market and get the best microscopes for students out there. Pick one that suits your needs as well as that of your kid. Do not forget to put the considerations in mind to be able to get the best quality as well as one that is worth your money.